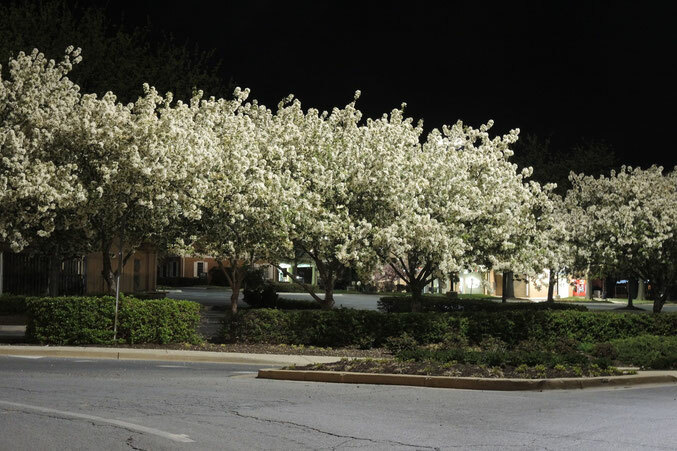 The location was on the edge of a small mall in Gaithersburg, Maryland. The "Take It!" came from seeing these trees under such bright illumination that the blossoms almost looked like they were basking in day time sun light. Not so ! the clock told me - and the black upper border served as confirmation. The After Take: To the few that I have shown this to - they all agreed that it was a cool picture of blossoming trees of which we have oodles of at this time of year. They could not discern what was so different about this shot. When I told them it was that there was not the usual blue sky background - because the shot had been taken at night - it was an " A hah " moment that was shared by me all over again. Every once in a while we are offered a picture of the usual in a different fashion. With luck we can see what may be a subtle, or in this instance, a huge difference. wow this is gorgeous. I wonder if there was some strategic light or tress placement to ensure these are a spectacle like this at night. I wish we could grow these out my way. They looks so cool there is a pink one that looks pretty cool too. You could almost put these trees on a pedestal. These are so beautiful. Are these in any way related to the cherry blossoms? By the way if anyone ever has the opportunity to catch the cherry blossom festival, I would highly recommend it! It is a great shot. Very good timing. I imagine it actually looks better at night with the lights than during the day. Epic! I want one of these trees! If only, I actually adopted this moniker after seeing someone else using it on a gardening website I frequent.